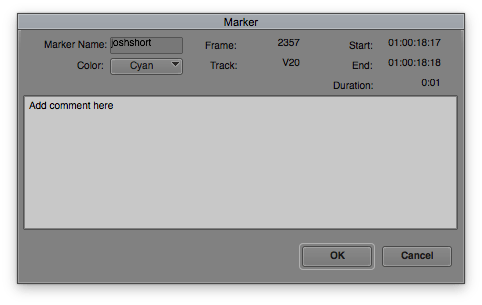 Before we go any further, I know they are now called markers in Media Composer. They are called markers in After Effects too. I don’t know what they’re called in Premiere (I can assume markers) and I have no clue if they even exist in FCPX. I like to call them locators, okay? In ~2009 I remember repeatedly being told to “digitize” a tape even though the correct term was “capture.” The person was still stuck in his ways and I judged him. In hindsight I was wrong to think so negativity of him. Maybe I’m reaching that point in my life (I don’t think so; I think and hope I’ll always adapt and adopt with ease). Regardless, for today, I call them locators. 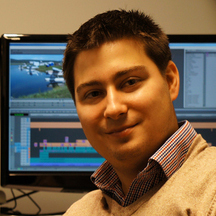 And they can play a crucial role in post production workflows. I use them for a variety of reasons but mostly for revisions. In this post I’ll cover what locators are, how I use them in my revision workflow and some tricks when using them. Note: I’m going to be talking a lot about Media Composer for the fine how-do details of this but the workflow and the reasoning is the same no matter what NLE you are one. 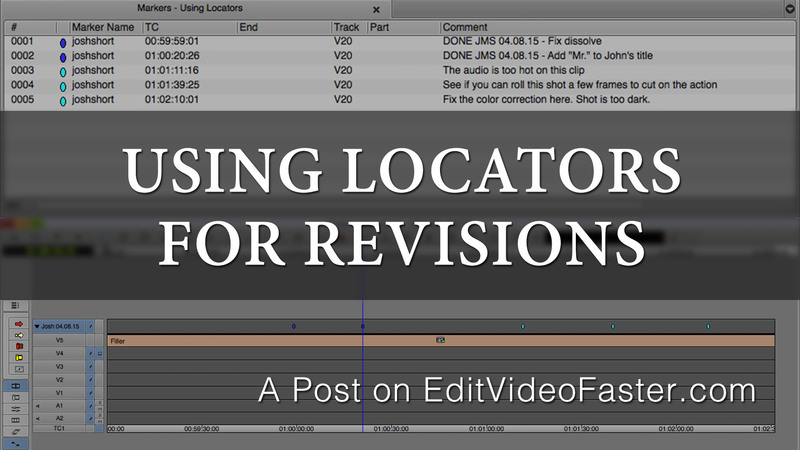 Locators are a way for you to leave comments to yourself or other editors. In Media Composer they are attached to a timecode and located on a track just like any clip in a sequence would be. They appear as small colored dots in the timeline (see below). This is an empty timeline with locators on the top track that I renamed to my name and the date. To add a locator you need to map one of the Add Marker buttons to a button on your interface or to your keyboard. Check out my tutorial on how to do this here. Once you add a new locator a box will pop up for you to leave a comment. You can also change the name of the person leaving it (it will default to the name of the user settings) and change the color. This is what pops up after you hit Add Marker. Type in your comment here and click OK.
Map one of the Add Marker buttons to your interface or keyboard. You can open up the Markers Tool under the Tools menu and selecting Markers. This displays all the locators in the timeline in list form. This is the Markers Tool. I ended up making a tutorial that also explains how to do a lot of this. Check it out here! Revisions are going to happen. It’s best to have a workflow in place to deal with them. Here’s what I do with locators in my NLE. I create a new top-most track. For Media Composer I use Cmd+Opt+Y (Mac) or Ctrl+Alt+Y (PC) to create a new track at a custom track number. Choose something like V20. I right-click on the track name and choose Rename Track… Then I rename the track from V20 to my name and the date. You can leave the name off in a single-editor environment. This is the track where I place all my locators. With Media Composer you can choose the color locator you want to use. I use cyan (light blue) for everything that I still need to do. Go through with the cyan locator and add a new one each time there is a change to be made. Write exactly what needs to be done so you don’t have to go back to refer to emails or sticky notes. When I make a change, I change the locator’s color to blue and write the word “done,” my initials and the date before my comment. When I work with the two colors I can quickly scan through the sequence to see how much I’ve done and how many revisions I’ve made in total. I use other colored locators for other things besides notes on revisions. I use the magenta (pink) locators for random things like, “Remember you didn’t use that other shot because there was a logo in the background.” If there is something that I desperately need to remember in the future I’ll use a red locator. This is usually something that is outside of my typical workflow like if it has a weird export setting or there’s something about the video that can’t be used somewhere or something like that. Whenever I open up an old project and see a red locator I jump right to it and see what it says. If (more like when) another round of revisions come in, I create another track on top of my first locator track and rename it with my name and date. Then I do that round of revisions with the same workflow. Why do I add locators at all? Isn’t this a waste of time just to say you updated a title? Well it could be a little wasteful at times BUT if you make it into a habit then the times that it is absolutely critical you keep good notes you’ll be a pro at it. And if you change a simple title five different times for a client, don’t you think you should know that and remember it for next time so you can charge more knowing that this project might take longer to complete? At some point you might have to prove that a client/producer/director told you to change something, even if it to them themselves! They might say, “Oh, I never told you to change that!” But you can go back to your locator, find the date and go back and find the exact words they used in an email telling you to change it. It also helps in a multi-editor environment. When you share a project you can leave notes for the other editor(s) about things to remember and things that need to get done. One last thing you can do with locators is having someone review it without you there. This sounds mightily risky. You should never have someone on Media Composer unless they know what they are doing. Unless you disarm them. Duplicate your sequence. Close every bin and clip possible. Create a new User Setting and remove every button on the interface except for Play, Pause and Add Marker. Do the same on the keyboard. Then you can have a producer or whoever sit down and review a video at his or her leisure without you being there. You’ll probably want to be there the first few times to properly train them but in the end if you have an empty extra edit bay you can save yourself a bit of time. Again, most of this is for Media Composer editors but you can probably use some of these tricks and advice if you’re editing with another NLE. In the Markers Tool, select column and hit Cmd+E (Mac) or Ctrl+E (PC) to sort by it. Double-click a marker in the Markers Tool to jump the Position Indicator (the blue bar in the timeline) to it. When Position Indicator is parked on a locator it shows up in the Record Monitor. Click the locator icon in the monitor to open up the box where you originally typed in your comment. Add Go to Previous Marker and Go to Next Marker to your keyboard (You can find that under the Move tab in the Command Palette). I have these are mapped to Shift+, (comma) and Shift+. (period). Keep locators on tracks without any audio or video on them. It keeps them out of the way and easy to see. I have the cyan and blue Add Markers buttons mapped to my keyboard to F8 and F9 for what it’s worth. Locators are a way for you to leave comments to yourself or other editors. Use them to track revisions in your editing workflow. Use different colors and different tracks to separate what you’ve done and when. This helps you to manage your time by seeing what you have to do and what you have done. This method will save you time and help you to better price out jobs with repeat clients. What is your workflow for revisions? Do you use locators or markers? How so? Let me know in the comments! Before you go, can you please do me a favor and share this with a fellow video editor? If you haven’t yet signed up to get emailed about new posts, go to the box in the top-right corner of this page and enter your email address there. You’ll only get notified when I come out with new posts like this each Wednesday and new tutorials on Fridays. I am working on another new and very exciting project too so make sure you’re signed up so you are first to know about it. Thank you as always for reading. Leave me a comment, share this post, subscribe to get emails from me and I’ll see you on Friday with a new tutorial! !